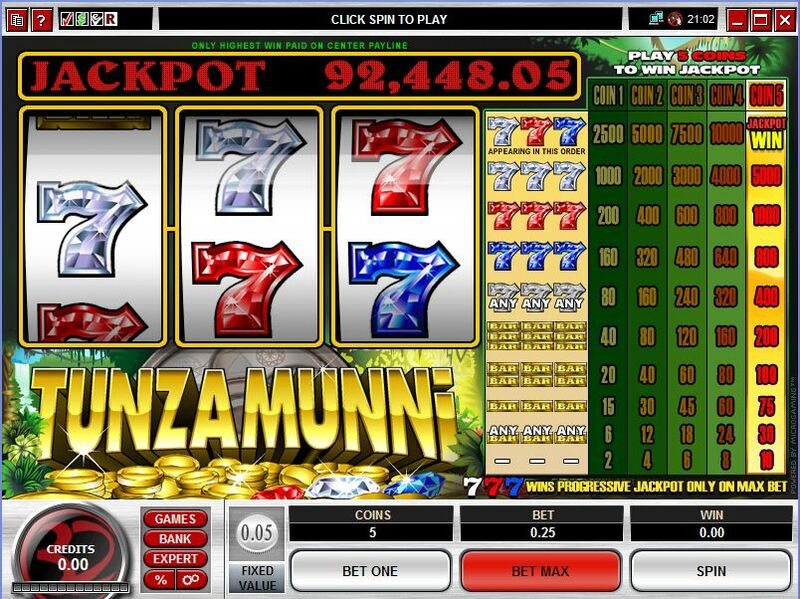 Tunzamunni is a Microgaming slot machine, a classic title which does things a bit differently than the other slots with the same layout that this developer has. For one thing, it uses up to five coins for a single payline. A progressive jackpot is another thing that makes it different, plus the graphics tend to be better than in most games of this type. The theme is tribal and treasure related, the background image being the only one to suggest this. A 3 reel slot machine, Tunzamunni offers 1 payline, but asks for quite a few coins for the wagers. In exchange, you are only offered one thing, a progressive jackpot which has often been won in the middle five figures range. You will discover no real features in this game. There are no wilds here, no bonus games that can be triggered and no multipliers. The number of coins that you can use each round is the thing that sets it apart from its competitors, plus the fact that you can trigger a progressive jackpot this way. It’s a very cheap game to play, so you have every reason to play with all the coins, since that’s the only way to get the biggest prize available. You have 5 coins that you can use, with fixed denominations of $0.05. That’s a wager that can only go up to $0.25, making this a perfect choice for a penny slot player. The rewards will offer you up to 10,000 coins when you get the three required symbols with wagers of up to 4 coins, meaning $500 at most. The progressive jackpot is offered for five symbols and the same three types of 7s, and in the past it has often been won at values of $50,000 or more. The record amount for this progressive jackpot has been at $75,000, while the minimum was $35,000. The game is half classic, half tribal. The reels and the paytable are occupied only by classic icons, but they are designed to look like they’re made out of colored precious stones or out of gold, so they don’t look like the symbols from other 3 reel titles. The background picture shows you a jungle location, with treasures spread in the area next to the logo. The quality of the background picture is better than in most classic slots. Symbols: White, Red and Blue 7 (progressive jackpot or 10,000 coins), White Seven (5,000 coins), Red Seven (1,000 coins), Blue Seven (800 coins), Three Gold Bars (200 coins), Two Gold Bars (100 coins) and One Gold Bar (75 coins). Given that you’re only using $0.25 wagers each round, and that you get great graphics and a chance at a progressive jackpot, I’d say it’s definitely worth playing. You will find Tunzamunni at any online casino which chooses to use software from Microgaming, playable either for free or for real money.